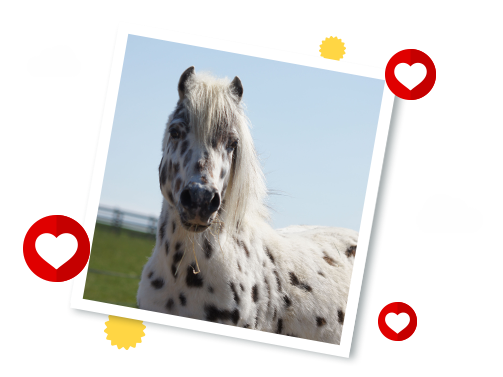 Cookie was announced as a new Adoption Star in March 2018 to commemorate the 10-year anniversary of one of Redwings biggest ever rescues. Cookie was one of over 100 horses and donkeys rescued from the terrifying conditions of Spindle Farm, Amersham, in 2008. With barely any food or water, many were too weak to stand and others had simply stopped fighting to survive and had passed away. Cookie is now a content pony who loves a cuddle, especially while enjoying a good groom. His standout spots and handsome looks make him a perfect candidate for the Adoption Scheme. Cookie lives at Redwings Aylsham, just north of Norwich, in Norfolk.